The Oil Market: Fixing A Broken Model. The run-up in the oil market is probably the single most destructive factor that is responsible for the deterioration in GDP growth the last two quarters, and signs of a potential recession. Why? Because it is one thing if the economy is booming and oil prices were high reflective of true dynamic demand in the economy, but it is an entirely different matter when prices are artificially high by a substantial amount and not reflective of demand in the market. That translates to a humungous tax being placed on the entire global economy which in the end is deflationary, and detrimental to economic prosperity. Let us now examine the Brent Futures contract, which traded as high as $127 a barrel, and was trading as low as $97 a barrel just recently. 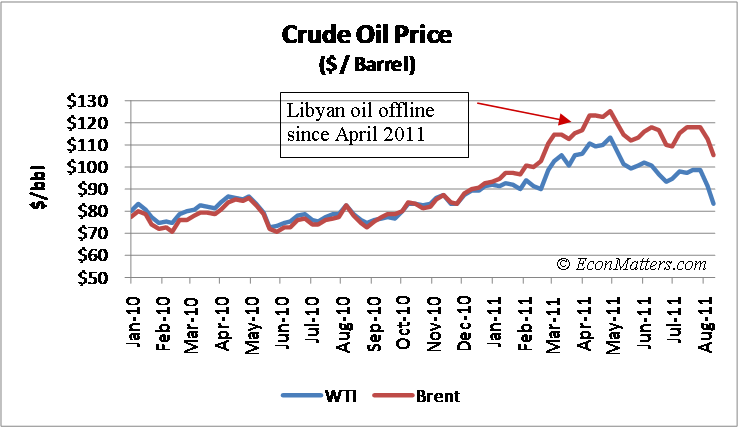 Again, the fact that Libyan oil being offline was commonly used as the reason for it trading at such high prices, but notice there was no actual correlation between Libyan oil offline and $97 or $127 a barrel, and that alone is a $30 per barrel price discrepancy. The world needs a better pricing method for dictating price of such an important commodity. The real problem with the Brent Futures market is that there is no transparency whatsoever, there are no inventories tied to the futures market to judge historical inventory versus current levels, and the market doesn`t have a physical delivery mechanism in place. It literally can be any price, just pull a number out of a hat, because it is completely divorced from a fundamental marketplace where price would be set by producers and consumers. There are no producers and consumers setting the prices in either of these markets though as even WTI contracts that take delivery each year is so minuscule, i.e., so far less than 1% to be essentially a no delivery market as well. The high premium for Brent oil compared to WTI (as much as $25 a barrel at times) is often rationalized as being based upon fundamental demand for Brent versus WTI, but that is just a smokescreen for the actual reasons which are that all the big players love the Brent market because it lacks any transparency, no inventories or delivery metrics, and the fact that it is such any easier market to obscure position limits. 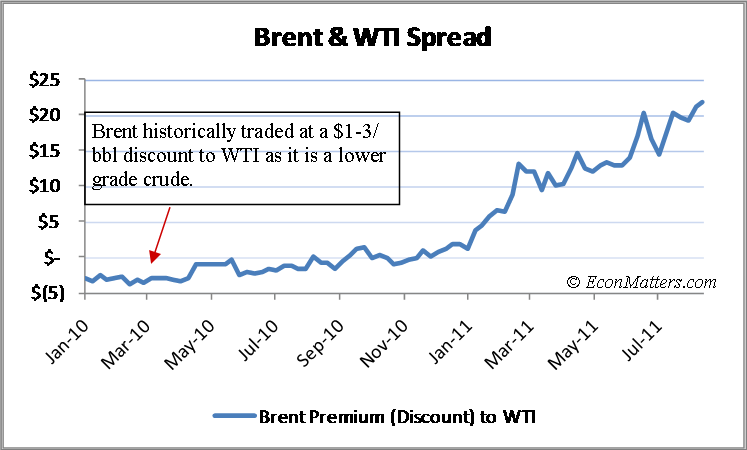 These are the primary reasons for the hefty Brent premium, and not fundamental supply issues. Another point worth noting is the QE2 affect on Oil prices, Bernanke steadfastly denied this but as we can examine in retrospect, it was absolutely a major factor in the rise of the commodity right after the Jackson Hole speech straight through to the MENA (Middle East & North Africa) conflict. It is just too tempting for Wall Street when $50 Billion is being created out of thin air each month to move some of this newfound capital electronically into the Oil markets. After all, it was Bernanke`s stated goal to inflate asset prices, and the oil markets are assets the last time I checked, and commodity assets to boot, which get more love with loose monetary policy initiatives. But the Fed at times will need to stimulate the economy with various policy initiatives, and the changes I am suggesting will help insulate the oil markets from such fed policy measures so that we can have the best parts of the stimulus, i.e., the wealth affects and business optimism, and leave out the worst parts of the stimulus in higher oil and gasoline prices which slow down the economy. So here are the changes that need to be made to the oil markets, I actually feel that agricultural and some other key commodity groups may also need to addressed in the same fashion as these are too important commodities not to be based upon the fundamental supply and demands dynamics of a true marketplace and not a bunch of artificially created electronic/paper infused speculation but that is for another time. 1) WTI & Brent futures contracts opened for each month must be 100% deliverable, so you either provide delivery or take delivery each month or time frame in the future, and positions can be as large as any participant needs. This will bring back some market fundamentals of true price discovery as all participants will actually utilize the commodity, no more paper market mechanism in place. So in short, a trader can speculate all they want, they just have to take delivery or provide delivery – this will cut out a bunch of the nonsense that currently goes on in these markets. 2) The Brent contract needs to be connected with some European storage facilities so that there can be a weekly transparent update which has historical benchmark capabilities so that inventory levels can be tracked and analyzed similarly to the EIA`s reporting on US inventory levels and statistics. This is long overdue, and for such an important commodity the fact that this has taken this long to occur in the era of modern technology is just ridiculous. This isn`t the dark age. Isn`t knowledge and actual real data important for efficient economic resource planning and forecasting purposes? The Brent contract shouldn`t be clouded in mystery, we shouldn`t have to take some anecdotal thoughts on Brent inventory levels, we should just be able to access the numbers in a weekly report that show the supply levels either well above or below their historical five-year levels just like the WTI contract and the total US Inventory Regions. Yes, traders are going to have to find other markets to make their living, but frankly the oil market is too important to the vital health of the global economy to not return to price discovery based upon fundamental supply and demand, and not paper trading by large speculators for the sake of making money for a small elite group at the expense of the entire world population of consumers who are currently being artificially taxed by said speculators. If these changes are made we will never again have to question the legitimacy of the price of oil for all practical purposes. Yes I know big speculators can do the contango trade by taking delivery and store oil off the market, but there are costs to doing this– capacity restraints, and at some point the oil will come back to the market. Nevertheless, compared to what the current dynamics in place of 100% paper markets that exist in both the WTI and Brent Futures contracts, this will seem like a trivial “market price dislocation” and could be addressed if speculators seem to be purposely abusing the system on a case by case basis in the future. In reality this will be a major step forward in the right direction, if we have to make some minor tweaks along the way, then so be it. As the 2007 run-up to $143 and then back down to $33, and this last year`s move from the mid $70`s up to $115 and then back down to $76 illustrate these markets are broken, and no true price discovery mechanism exists other than what the speculators say the price of oil is via capital inflows and outflows. This current model leads to inefficient pricing and increased volatility which hurts economic growth and needs to be replaced by actual true price discovery of supply and demand fundamentals dictating the market price. Price needs to be dictated by producers and consumers who actually either create or consume the commodity, and not the large speculators who neither produce nor consume the commodity but paper trade it. This leads to continual distorted and mispriced markets which in itself indicates that we have a problem in how these oil markets are being priced. From Oil Market: Rectifying The Broken Paper Pricing Model | EconMatters.